Alternative sights of St. Petersburg. Traditionally, the city on the Neva is used primarily to associate with classical and iconic sights, and tourists do not get tired of driving around the Hermitage, the St. Isaac's Cathedral and the Peter and Paul Fortress. But there is another image of the city - laconic, technological and no less interesting. These are bridges, modern art on the streets of the city, the famous Lakhta tower, which rises above the cultural capital. There are a lot of modern architectural projects in Petersburg, and there is not enough space to tell about all of them. Office and residential buildings combine classical architecture with glass and mirror walls, which makes it look futuristic and remind us that we live in an era of progress and high technologies. One of the interesting projects is the Quattro Corti business center, which Italian craftsmen designed for Petersburg. "Despite the fact that this office building is already 7 years old, Quattro Corti is one of the most advanced and interesting office buildings in St. Petersburg. Not without reason is the headquarters of Gazprom Neft. An exceptionally Italian construction from the Piuarch design studio with a budget of construction investments of 10 million euros and the most advanced engineering equipment. A stylish building from fashionable architects who have become famous for office spaces for the Dolce and Gabbana empire. " If you have heard the words "modern architecture" and "Petersburg", then the word "Lakhta" will certainly appear - and not for nothing. It is difficult to leave aside one of the most high-profile architectural stories of recent years, which is already visible from anywhere in the city and even from the suburban settlements of the Leningrad Region. "The symbolism of Lakhta Center is that, like any great architecture, it is the most accurate cast of its time. Highly-logical lonely vertical - a certain symbol of our statehood. From the point of view of the city, it is a symbol of Modern Petersburg with a new network of high-speed highways, a stadium and the New Stage of the Mariinsky Theater. This is a kind of New Peter and Paul Cathedral. The center radically changes the life of the city from the direction of the resort. " Another loud project of recent years. Unusual, standing out against the background of historical buildings, it attracts the views of tourists and residents of St. Petersburg. It was built very quickly, despite the incredible complexity. Immediately it was clear that the original project of Dominique Perrault was beyond the power to implement, so the project had time to redo it. Secondly, it is an object, the essence of which lies in its internal qualities. No wonder its facade creates an interior. In this there is an informal approach, close to creative natures. Thirdly, the interior is gorgeous: onyx with Swarovski crystals is incomparable, a lot of glass was used in the decoration. Fourthly, here is the best troupe and magnificent new productions, which became possible due to a large stage corresponding to the new world standards. And fifthly, here we see a bridge, thrown across the Kryukov Canal, which very symbolically connects historical and modern buildings into a single structure. This union clearly demonstrates that without the classics there is no modernity, and without modernity there is no sense in the classics "
Another architectural structure, enclosed in a glass, the facade of which is similar to the nose of a futuristic spaceship. The unusual appearance of the building here is justified not only by location, but also by the modern approach to architectural projects. "The bourgeois project of the business center at the corner of Pioneer Street and the embankment of Admiral Lazarev meets the concept of the surrounding modern buildings. The building fits well in a corner, it is pleasant to look at from elite residential complexes across the street. In addition, the center has a high useful area. Strikingly different from the imperial classical Petersburg, some bridges. Their aesthetics shifts more likely to the realities of the modern life of a big city than in the era of Peter the Great. Such, for example, is the Bolsheokhtinsky Bridge, built in the 1910s. It is difficult to confuse anything with twenty-meter towers in the form of lighthouses. On the walls of these towers, the most sharp-sighted people can see six bronze plaques on which the names of the bridge builders are knocked out. A system of openwork nets of metalwork resembles the famous Tower Bridge of London. This bridge is located away from tourist routes. Another bridge, recognized as one of the longest bridges in Russia. Its secret lies in the design, in which the surface of the bridge is supported by cable-stayed structures . This non-waterproof giant was built in 2004 as part of the grandiose construction of the ring road around St. Petersburg and today is the largest bridge across the Neva. Cable-stayed structures, creating the effect of a suspension bridge, are visually transferred somewhere in the area of ​​Los Angeles and its "Golden Gate". In fact, the Bolshoi Obukhov Bridge combines two identical bridges with the opposite direction of motion: the upper one is designed for driving in the east direction, and the lower one - in the western direction. It's now customary to scold motorways and junctions, but this architecture of great speeds has a special charm. And the construction of a round-the-clock crossing was an important historical moment, which radically changed the way of life of the residents of St. Petersburg on white nights. Now, though making a big detour, you can always get to the other shore in summer. The first non-waterborne navigation bridge across the Great Neva opened the era of New Petersburg, which is now girded with a network of such first-class cable-stayed bridges. These bridges have made life in the city much more comfortable. This bridge, which connects the Petrograd and Krestovsky islands, is also a cable-stayed structure. Before the 2008 reconstruction, it was a wooden Koltov bridge, which eventually changed beyond recognition. The spirit of urbanism is most clearly expressed in massive metal structures borrowed from the bridge of Lieutenant Schmidt and rushing from the center of a peculiar dome to both banks. Another "beginner" of the 21st century is the six-lane Betancourt bridge with a bicycle path, thrown across the Malaya Neva. "The new suspension bridge Betancourt from the Vasilievsky Island to the Petrograd side is the shortest, but the most" picky "from the new in St. Petersburg. Its characteristic feature is a pleasant curve of the route and two powerful curved supports. By its incompleteness, it reminds me of something antique, the skeleton of a once slender high construction. This short bridge forever changed Vasilievsky Island and Petrogradka. Now they are almost the same whole. " Informal and creative spirit of St. Petersburg can be inspired through non-facade facades - art street art of the city has become one of his unofficial business cards in terms of contemporary art. 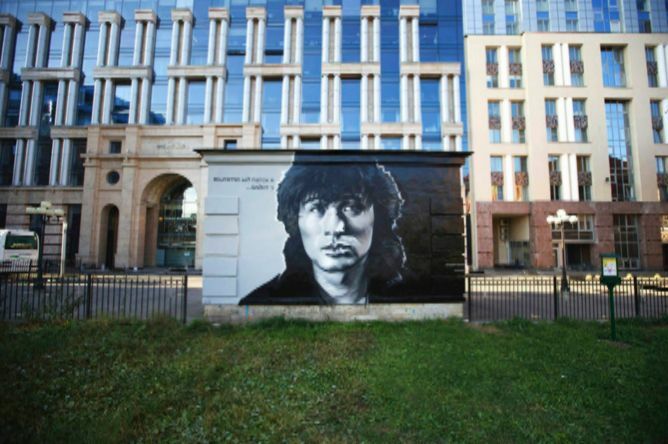 A series of portraits of famous people - movie stars, singers, musicians - appeared in the central part of St. Petersburg thanks to the efforts of street art artists from the association HoodGraff. Unfortunately, not all the works have survived, but some portraits still live and please the eye. Among the most famous star graffiti is Vladimir Vysotsky (Moscow Avenue, 73), Viktor Tsoi (between Vosstania Street, 8 and Mayakovskogo Street, 5), Sergei Bodrov (Alexander Nevsky Square), Yuri Shevchuk (Liteiny Avenue, 37-39), Mr. Bean (Hellenic Ave, 8a), Tony Hawk (13 Vvedenskaya Street), Hugh Hefner (Sennaya pl., 5), Bee Bee King (3rd Soviet) and Morihei Ueshiba, who was tired of repeating that he was not Confucius (the Garden of Friendship on the Liteynyy zavod ). Another no less popular graffiti is a portrait of Mikhail Boyarsky with a scarf "Zenith" from the union YouFeelMySkill (graffiti is located on the corner of Petrogradskaya and Morskoy pr.). And lovers of literature will surely like Daniil Harms, who gazes at passers-by from house 11 on Mayakovsky Street. "The guys from HoodGraff and YouFeelMySkill have a high professional level, recognizable by the pitch, and their concepts meet the artistic and ethical needs of the younger generation. In addition, they have a sense of relevance, so important in St. Petersburg. They understand where to draw, and where not worth it. This puts them in the category of important cultural phenomena of our time. Pure art on the walls of the city can be seen thanks to the efforts of the artist Ulyana Poloz. As part of the #outingsprojectspb project, she placed reproductions of famous paintings on the walls of St. Petersburg's houses. One of the most famous works of Ulyana is on the street. Nekrasova, 14: she especially fell in love with connoisseurs of beauty. Other reproductions settled in the courtyard of the Konushennaya Square; on the street. Radishchev, d. 17-19; on the embankment of Moika, 114; on the street. Pisarev, 2; on the street. Stremyannaya, 3 and in other parts of the city. It is worth hurrying with the excursion, as, unfortunately, these reproductions are regularly spoiled or removed from the facades. Among other unusual solutions for facades are reproductions of paintings by Gustav Klimt in the LCD "Vena" (Kudrovo), a map of constellations and images of legendary cosmonauts in the Cosmonauts Yard (Pionerskaya St., 22), graffiti in honor of the 200th anniversary of the Battle of Borodino (ul. Krasnogo Kursanta, 8) and graffiti "Scarlet Sails" (Ligovsky Ave., d. 183 B). "Posters with fragments of classic paintings from Ulyana Poloz, scattered in different parts of our city and located on the shabby walls of houses, is a real masterpiece.